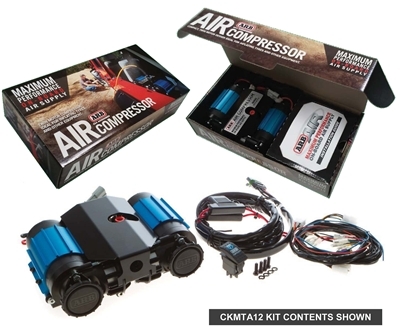 ARB's new CKMTA12 and CKMTA24 twin on-board compressor kits were designed offer compact sized yet high-volume air compressor to suit the high volume airflow needs of most air powered tools, and also to power the actuation and control needs of an ARB Air Locker diff, and the harsh and demanding environment of the Jeep Enthusiast. Full wiring loom included for simplified installation and easy plug-in connectivity to Air Locker control solenoids. 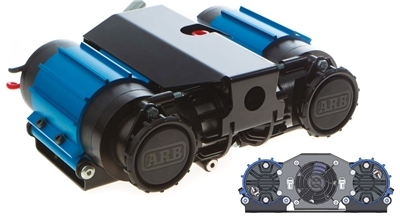 Questions about this ARB On-Board Compressor for your Jeep JK Wrangler? Talk to our Jeep Modification Experts today - call 714-582-3330 or chat with an expert online now!